In this, Charlie Chaplin's first talking film, he skewers both Adolf Hitler and Benito Mussolini on sharp spears of ridicule. Since Adolf Hitler had the audacity to borrow his mustache from the most famous celebrity in the world -- Charlie Chaplin -- it meant Hitler was fair game for Chaplin's comedy. A revealing look at why we dehumanize each other, with stunning examples from world history as well as today's headlines. CBI - China: Day 90 of 142 of the 1st Battle of Hebei. Spain: Day 258 of 985 of the Spanish Civil War. German bombers attack the mountain strongholds of the Republicans and the battered village of Ochandiano is quickly taken by the Nationalist Army of Navarre. Spanish Nationalist forces begin an offensive against the Republican Basque forces in Vizcaya with the intention of capturing the Basque stronghold of Bilbao. Spain: Day 623 of 985 of the Spanish Civil War. CBI - China: Day 268 of 2,987 of the 2nd Sino-Japanese War. Day 53 of 124 of the Battle of Henan. Day 8 of 15 of the Battle of Taierzhuang. Day 8 of 39 of the Battle of Xuzhou. UK: British Prime Minister Chamberlain makes an official pledge saying that, along with France, Britain will defend Poland with military force if necessary. Eastern Front: Day 9 of 13 of the Slovak-Hungarian War, aka the Little War. For the most part, this war is over, but in some places the fighting will continue for another four days. CBI - China: Day 633 of 2,987 of the 2nd Sino-Japanese War. Day 15 of 54 of the Battle of Nanchang. ETO: British Prime Minister Chamberlain calls off the mining of the Norwegian coast in protest of France to the mining of the Rhine River. Italy: Mussolini informs King Vittorio Emanuele III of Italy that Italy will soon enter the European War. CBI - China: Day 999 of 2,987 of the 2nd Sino-Japanese War. Day 138 of 381 of the Battle of South Guangxi. Day 64 of 67 of the Battle of Wuyuan. The Japanese troops complete their evacuation of Wuyuan. USA: A US scientific/military team arrives in the Danish colony of Greenland to consider the establishment of military bases there. Atlantic: German sub U-46 sinks Swedish tanker CASTOR 300 miles east of the southern tip of Greenland, killing the entire crew of 15. Atlantic: Before dawn, RAF bombers attack the German warships SCHARNHORST and GNEISENAU in Brest, France, but score no hits. ETO - UK: Day 207 of 258 of the Blitz. British civilian casualties for March are tallied at 4,259 killed and 5,557 injured. ETO - Switzerland: British Army Dental Corps Private Coe arrives in Switzerland after escaping from a German POW camp, becoming the first to successfully do so. MTO - Greece: The Italian submarine AMBRA sinks the British Cruiser HMS BONAVENTURE 125 miles south of Crete. MTO - Italy: The British submarine HMS RORQUAL sinks the Italian submarine PIER CAPPONI 28 miles northwest of Messina, Sicily, killing the entire crew of 49. MTO - Libya: German and British troops clash at the town of Mersa Brega. After 12 hours of heavy fighting, German tanks break through, forcing the British to withdraw toward Agedabia. East Africa: Day 295 of 537 of Italy's East African campaign in the lands south of Egypt. The Indian 5th Infantry attacks the Italians near Adi Tekelezan. East Africa - Eritrea: Day 55 of 56 of the Battle of Keren. British troops break through the roadblocks between Keren and Asmara. East Africa: Three Italian destroyers leave Massawa, Eritrea, to attack the British port at Port Sudan, British Sudan. While en route, one hits underwater rocks and sinks, so the other two return to Massawa. CBI - China: Day 1,364 of 2,987 of the 2nd Sino-Japanese War. Day 18 of 27 of the Battle of Shanggao. CBI - Thailand: Day 182 of 221 of the Franco-Thai War (Vichy France vs Thailand). Atlantic: Day 77 of 169 of Germany's Second "Happy Time," during which U-boats sink 609 Allied ships with little risk. U-754 sinks US tug MENOMINEE, barge ALLEGHENY and barge BARNEGAT northeast of Hog Island Lighthouse, Virginia. Later on, U-754 also sinks US tanker TIGER. Russian Front - North: Day 205 of 872 of the Siege of Leningrad. Russian Front - North: Day 52 of 102 of the Battle of the Demyansk Pocket, another failed attempt to break the siege at Leningrad. Russian Front - North: Day 68 of 103 of the Battle of the Kholm Pocket. Another attempt to break the siege at Leningrad. Russian Front - Center: Day 83 of 103 of the Battle of Vyazma, Russia. Russian Front - Center: Day 83 of 103 of the Battle of Sychevsk, Russia. Russian Front - Center: Day 29 of 49 of the Battle of Rzhev, Russia, a diversion to pull more German troops away from Moscow. Russian Front - South: Day 153 of 248 of the Siege of Sevastopol, Crimean Peninsula. Soviet troops defeat the German 17th Army in the Kuban Peninsula and capture Anastasyevsk north of Novorossiysk, near the coast of the Black Sea in southern Russia. CBI: Day 1 of 11 of the Japanese Naval raids on Allied ships throughout the Indian Ocean. CBI: Day 1 of 2 of the Battle of Christmas Island. As Japanese troops are landing, the submarine USS SEAWOLF tries to stop them, but can't. CBI - Burma: Day 108 of 164 of Japan's Invasion of Burma. After a two-day battle, the Japanese troops defeat the Chinese troops at Toungoo. CBI - China: Day 1,729 of 2,987 of the 2nd Sino-Japanese War. Day 98 of 99 of the 3rd Battle of Changsha. CBI - India: The Indian Congress Party demands immediate independence from the United Kingdom. PTO - Borneo: Day 106 of 107 of the Battle of Borneo. PTO - Malaya: Day 41 of 357 of the Battle of Timor Island. PTO - Philippines: Day 114 of 152 of the 1st Battle of the Philippines. 5th Air Force provides air support. PTO - Japan: The first broadcast of "The Zero Hour" is made, a radio program of jazz, popular music and news, interlaced with demoralizing commentary and appeals to surrender or sabotage the Allied war effort. It will be broadcast regularly until 12 Aug 45. Iva Toguri D'Aquino, aka "Tokyo Rose"
Tokyo Rose was a generic name given by Allied forces in the South Pacific during WWII to any of approximately a dozen English-speaking female broadcasters of Japanese propaganda. The name is most strongly associated with Iva Toguri D'Aquino, an American citizen born to Japanese immigrants. D'Aquino broadcast as "Orphan Ann" during the 15-20 minute DJ segment of the 75-minute program The Zero Hour on Radio Tokyo (NHK). The program consisted of propaganda-tinged skits and slanted news reports as well as popular American music. The intent of these broadcasts was to disrupt the morale of Allied forces listening to the broadcast. American servicemen in the Pacific often listened to the propaganda broadcasts to get a sense, by reading between the lines, of the effect of their military actions. Farther from the action, stories circulated that Tokyo Rose could be unnervingly accurate, naming units and even individual servicemen. The name "Tokyo Rose" in the context of these broadcasts first appeared in US newspapers in 1943. 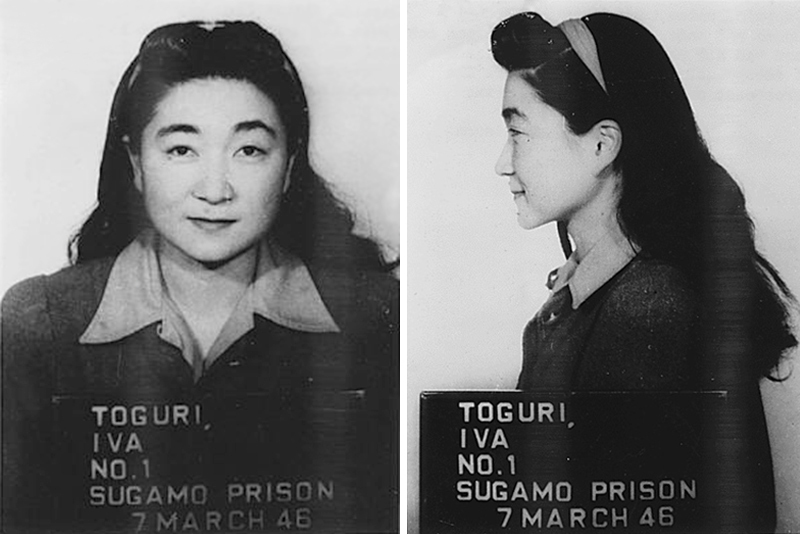 When the war ended, the US military detained Toguri for a year before releasing her for lack of evidence. Department of Justice officials agreed that her broadcasts were "innocuous." But when Toguri tried to return to the US, a popular uproar ensued because Walter Winchell, the powerful broadcast personality, and the American Legion lobbied relentlessly for a trial, prompting the Federal Bureau of Investigation to renew its investigation of Toguri's wartime activities. Her 1949 trial resulted in a conviction on one of eight counts of treason. In 1974, investigative journalists found that key witnesses claimed they were forced to lie during testimony. Toguri was pardoned by US President Gerald Ford in 1977. Toguri's advocates have long argued that other announcers better suited the legend. These include the American Ruth Hayakawa (who substituted for Iva on weekends), Canadian June Suyama ("The Nightingale of Nanking"), who also broadcast on Radio Tokyo, and Myrtle Lipton ("Little Margie") who broadcast from Japanese-controlled Radio Manila. However, during the war, journalists and officials with the US Foreign Broadcast Information Service identified Toguri's "Orphan Ann" as the woman "most servicemen seem to refer to when they speak of Tokyo Rose" but characterized the "legends" of clairvoyance that "piled up about 'Tokyo Rose'" as "apocryphal." ETO - Netherlands: US 8th Air Force B-17s and B-24s attack the shipyards and dock area at Rotterdam. ETO: German Luftwaffe Major General Peltz is placed in charge of bombing raids against Britain. Germany: Hitler meets with Bulgarian King Boris III at his headquarters at Rastenburg, East Prussia, Germany. Germany: The newly built gas chamber/crematory II begins operations at Auschwitz Concentration Camp. Russian Front - North: Day 570 of 872 of the Siege of Leningrad. Russian Front - North: Day 50 of 51 of the USSR's Operation POLAR STAR, a failed offensive north of Leningrad, hoping to take the southern shore of Lake Ladoga, Russia. Russian Front - North: Day 331 of 658 of the Siege of the Kholm Pocket, USSR lays siege to the Kholm Pocket but the Germans hold out for a about a year and a half. Russian Front - Center: Day 30 of 30 of the 3rd Battle of Rzhev-Sychevka, Russia. MTO - Sardinia: US 12th Air Force RAF bombers night bomb the Decimomannu Airfield. During the day, US B-17s hit Villacidro, Monserrato and Decimomannu Airfields and Cagliari harbor. MTO - Tunisia: Day 135 of 178 of the Battle of Tunisia. RAF and US Air Forces provide Allied air support. Day 9 of 16 of the Battle of El Guettar. The battle at Hill 369 continues. British troops occupy the coastal town of Cap Serrat, forcing the Germans to move north to Wadi Akarit. CBI - Burma: Day 101 of 104 of the 1st Battle of Arakan. US 10th Air Force provides air support. CBI - Burma: Day 52 of 79 of the Allied Operation LONGCLOTH. CBI - China: Day 2,094 of 2,987 of the 2nd Sino-Japanese War. PTO - Alaska: Day 298 of 435 of the Battle of Kiska, Aleutian Islands. PTO - Australia: The Australian 9th Division parades through Melbourne thrilling a crowd of over a half a million people. PTO - Solomon Islands: Japanese planes bomb targets in the Russell Islands. USA: US Navy cancels all contracts signed prior to the Pacific War with civilian construction firms for building projects across the Pacific. Atlantic: Aircraft from ships BEAGLE and TRACKER escorting an Allied convoy sink the German submarine U-355 in the Arctic Sea. ETO: Day 135 of 135 of the Battle of Berlin (RAF campaign). RAF losses since 18 Nov 1943 are 1,047 aircraft destroyed and 1,682 damaged and well over 7,000 aircrew. It is generally accepted that the Battle of Berlin was a failure for the RAF as it did not deliver the knockout blow that had been predicted. Russian Front - North: Day 59 of 191 of the Battle of the Narva Isthmus, Estonia. Both German and Soviet troops in the Baltic region remain in a defensive position. Russian Front - South: Day 99 of 113 of the USSR's Dnieper-Carpathian Offensive in southwestern Ukraine. Russian Front - South: Day 28 of 45 of the Battle of Chernovtsy, Ukraine. Russian Front - South: Day 7 of 15 of the Battle of Kamenets-Podolsky Pocket, Ukraine. Russian Front - South: Day 26 of 44 of the Battle of Snigirevka, Ukraine. Russian Front - South: Day 6 of 20 of the Battle of Odessa, Ukraine. MTO - Italy: Day 75 of 123 of the Battle of Monte Cassino. Bad weather keeps both sides fairly idle. MTO - Italy: Day 70 of 136 of the Battle of Anzio. Bad weather keeps both sides fairly idle. CBI - Burma: Day 93 of 99 of the 2nd Battle of Arakan. CBI - Burma: Day 27 of 166 of the UK's Operation THURSDAY. CBI - Burma: Day 22 of 147 of the Battle of Myitkyina. US 10th Air Force provides air support. Day 4 of 10 of an action at Nhpum Ga Ridge by the infamous "Merrill's Marauders" against 1,300 Japanese. CBI - China: Day 2,460 of 2,987 of the 2nd Sino-Japanese War. CBI - India: Day 24 of 118 of the Battle of Imphal-Kohima. PTO - New Guinea: Day 32 of 80 of the Battle of the Admiralty Islands. 5th Air Force provides air support. PTO - New Guinea: Day 195 of 219 of the Battle of Shaggy Ridge. 5th Air Force provides air support. PTO - New Guinea: Day 108 of 597 of the Battle of New Britain. US 13th Air Force provides air support. PTO - Solomon Islands: Day 152 of 295 of the Battle of the Bougainville Islands. US 13th Air Force provides air support. ETO: Allied commander General Eisenhower demands over radio that Germany surrender. ETO - France: Day 244 of 284 of the Battle of Brittany. ETO - France: Day 198 of 236 of the Siege of Dunkirk. ETO - Germany: Day 25 of 46 of the Battle of the Ruhr Pocket. The Germans start pulling out of the Netherlands. The French 1st Army crosses the Rhine near Speye, becoming first French troops to do so since Napoleon. US 3rd Army reaches Siegen 20 miles east of the Rhine. US 9th Air Force provides air support. ETO - Germany: US 8th Air Force bombs synthetic oil plants, a refinery, a munitions plant and a tank factory. Russian Front - Finland: Day 198 of 223 of the Lapland War. Finland and Russia have joined forces to kick the Germans out of Finland's most northern province. Russian Front - Center: Day 168 of 206 of the Battle of the Courland Pocket in Latvia. Russian Front - Center: Day 66 of 75 of the Battle of Königsberg, East Prussia (now Kaliningrad, Russia). Russian Front - Center: Day 50 of 54 of the Battle of East Pomerania, Germany. Russian Front - Center: Day 47 of 83 of the German Siege of Breslau (today Wroclaw, Poland). The Soviets have Breslau and Glogau surrounded. Russian Front - Center: Day 17 of 17 of the USSR's Upper Silesian Offensive in Germany (today Poland). The Soviets capture Ratibor. Russian Front - South: Day 6 of 21 of the Battle of Nagykanizsa-Körmend, western Hungary. Soviets cross the German border near Sopron, Hungary. Russian Front - South: Day 19 of 34 of the Battle of Vienna, Austria. MTO: US 15th Air Force bombs targets in Germany, Austria, Italy, and Czechoslovakia. CBI: US 14th Air Force attacks multiple areas throughout China and French Indochina. CBI - Burma: Day 56 of 99 of the Battle of Pakokku and Irrawaddy River operations in central Burma. The US 10th Air Force provides air support. The British 26th Division reaches the Burma Road, which ends eight months of fighting for it. CBI - China: Day 2,825 of 2,987 of the 2nd Sino-Japanese War. PTO: USS TIRANTE sinks a Japanese sailboat with gunfire. PTO - Japan: Japanese Army Renraku-tei special attack boats sink a US landing ship at Okinawa, Japan. PTO - Japan: US 20th Air Force B-29s destroy the Tachiarai machine works and bomb the Omura Airfield on Kyushu Island. PTO - New Guinea: Day 460 of 597 of the Battle of New Britain. US 10th Air Force provides air support. PTO - New Guinea: Day 344 of 481 of the Battle of Western New Guinea. US 10th Air Force provides air support. PTO - Philippines: Day 163 of 299 of the 2nd Battle of the Philippines, aka the Liberation of the Philippines or the Philippines Campaign. PTO - Philippines: Day 107 of 244 of the Battle of Luzon. 5th Air Force provides air support. PTO - Philippines: Day 22 of 159 of the Battle of Mindanao Island. 5th Air Force provides air support. PTO - Philippines: Day 14 of 135 of the Battle of the Visayas region. 5th Air Force provides air support. 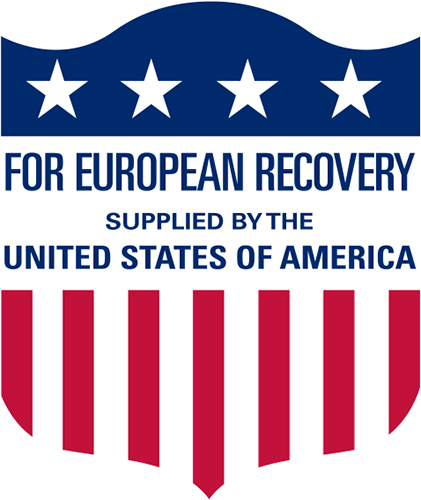 USA: Congress passes funding for the Marshall Plan, the large-scale program to aid Europe. The goals of the US are to rebuild a war-devastated region, remove trade barriers, modernize industry and to make Europe prosperous again. 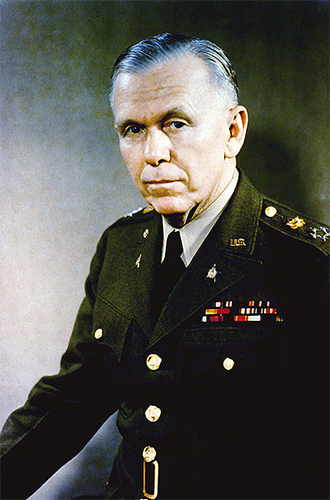 Marshall was an American military leader, Chief of Staff of the Army, Secretary of State and the third Secretary of Defense. Once noted as the "organizer of victory" by Winston Churchill for his leadership of the Allied victory in World War II, Marshall served as the United States Army Chief of Staff during the war and as the chief military adviser to President Franklin D Roosevelt. As Secretary of State, his name was given to the Marshall Plan, for which he was awarded the Nobel Peace Prize in 1953. The labeling was deemed necessary when Congress became concerned that the Soviet Union was taking credit for the poorly-marked US foreign aid donations to European countries. The slogan was translated into the languages of the recipient countries. The slogan became obsolete when military aid was added to the economic program and when some Near East and Asian countries became aid recipients under President Truman's Point IV Program. In 1951, the slogan was changed to "Strength for the Free World from the United States of America."